One thing you know about me, if you’ve ever met me in real life, is that I absolutely love Indian food; more specifically I like spicy Indian food. One of my favourite dishes to order in was (and is) a chicken madras. I love the level of spice and this smoky hint of flavour you get from a really well cooked version of this dish. My curry habit wasn’t cheap – because I’m also a fan of all the bits and pieces that one orders alongside takeaway Indian food – so for that reason I did my research (many moons ago) and found a recipe that I’ve adapted over the years to work for me, and save some pennies. My chicken and mushroom madras is pretty banging, but first of all I must fess up to two things. 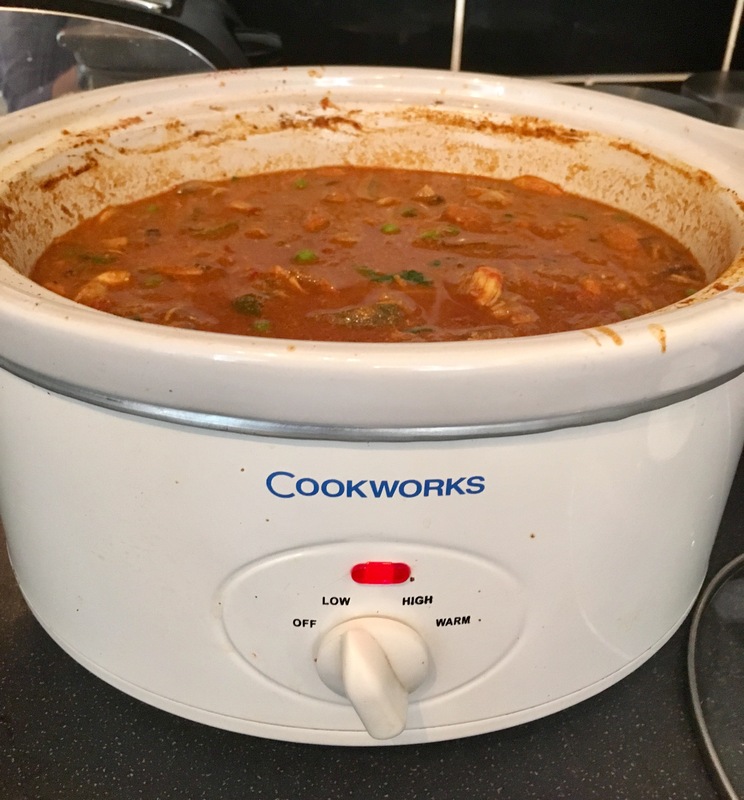 Firstly, I use a slow cooker (Cookworks, from Argos) and secondly I use a premixed madras spice blend by Indus BUT I also add to this with more or other flavours. 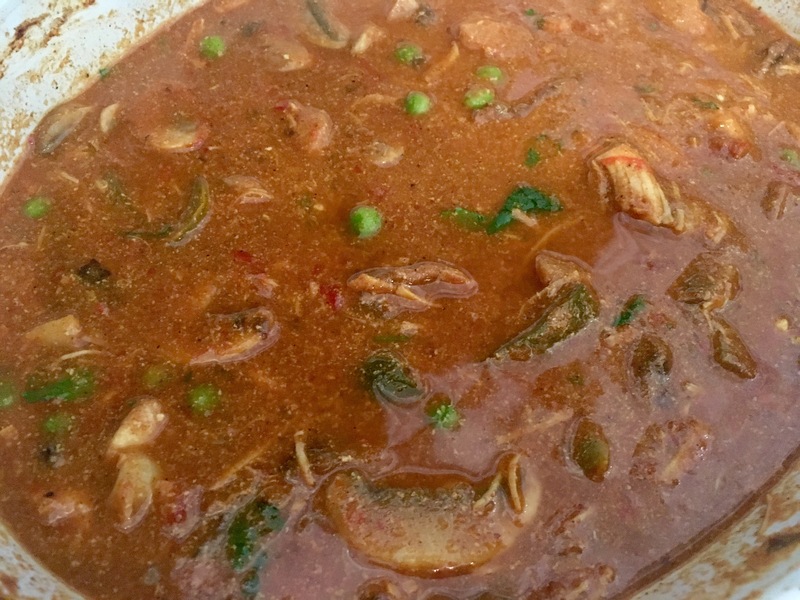 I have always enjoyed making slow cooker curries and stews but was always confused why, despite all the stirring, I’d end up with a watery split sauce, but I’ve since discovered the key lies in blending many of the ingredients into one sauce, rather than adding one by one. In a blender (I use, love and swear by the Nutribullet) combine a tin of chopped tomatoes, one large white onion, two cloves of garlic, chillies (use as many as you like for heat, I like 1 red and 3-4 fine/finger green chillies personally) and a handful of corriander. Blitz to form a paste before adding some milk (I use Alpro coconut milk) and blitzing again to form a thick sauce. Add that sauce to the slow cooker and mix in a 500g tub of natural yoghurt and two tablespoons of pre mixed madras power. You can use full fat or low-fat yoghurt depending on your preference. Turn the slow cooker onto high and mix all of the ingredients so that everything is covered. Now comes the easy bit: walk away leave it for 7 hours. Literally leave it. No, don’t stir, peek, faff. Leave it. When the seven hours are up (you’ll know because your slow cooker will look like a murder scene – see the picture below) taste the sauce and see what needs adding. I usually add smoked paprika for depth and a smoky flavour, plus extra cumin and garam masala. I also add a handful of peas, fresh chopped coriander and squeeze in half a lemon. Lastly, use two forks to pull the chicken apart, so instead of full breasts or chunks you have tender slithers of meat which are almost part of the sauce. Not an authentic madras (at all) but my word is it good. And the best bit? It’ll easily serve 4 people, so great if you’re budget cooking for a group. You can serve this with your choice of rice or naan bread, and of course selection of popadoms. I like to buy the uncooked popadoms and make them fresh – you can do this in oil or just by slipping them into the microwave for 15 seconds. I love a fresh flavour hit with my curry, so I make a mint and yoghurt dip as well as a cucumber, tomato and red onion salad. These little added extras in my opinion make all the difference. I know 7 hours seems mildly ridiculous but I promise it’s worth the wait. The chicken is beyond tender and the sauce flavours have developed and evolved so much.